As I near the end of my dining room makeover and start to put the finishing touches on the room, I stand amazed at what a difference a little fabric and paint can make. I’m so close to the end and couldn’t wait to give you a few sneak peeks! 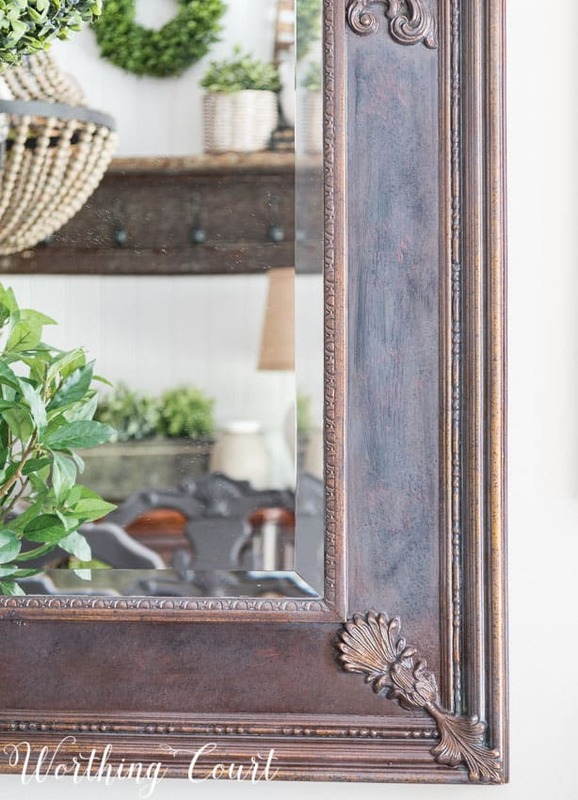 At the beginning of this makeover, I had no intention of painting any of my furniture, other than possibly painting the small chest that was located under the mirror. I agonized over that little chest. Then, I remembered that I already had a gray chest in my foyer. After moving it into my dining room and changing the hardware, I knew that I couldn’t stop there and wound up painting almost every piece of furniture in here. Ha! If you’ve been following the makeover progress, then you’ll notice that the chair beside the chest is different than what originally resided here. When Pookie asked me what I wanted for my birthday, I immediately said, “Recover the old office chairs!”. And so we did. Happy birthday to me. Click HERE to see the original chairs. I found the awesome buffalo check fabric at a local fabric shop! Once I moved the gray chest from the foyer into the dining room, the sea of brown furniture bothered me even more. That chest and the fabric that I recovered the chairs and chair cushions with was the jumping off point for painting the rest of the furniture. The brown chairs just didn’t look that great with the gray and white fabric. Of course, one thing leads to another. Right? After the chairs were painted, it became obvious that I needed to do something with the table. Sooo….I painted the legs of the table to match the chairs. There was no way that I was going to haul that heavy table outside so that I could spray paint it though. I simply sprayed a solid coat of the spray paint onto a scrap of wood and took it to my local Sherwin Williams paint store to get them to color match it for me and it was perfect!. All I had to do was to put a dropcloth under the table and spend an afternoon with my trusty paint brush. 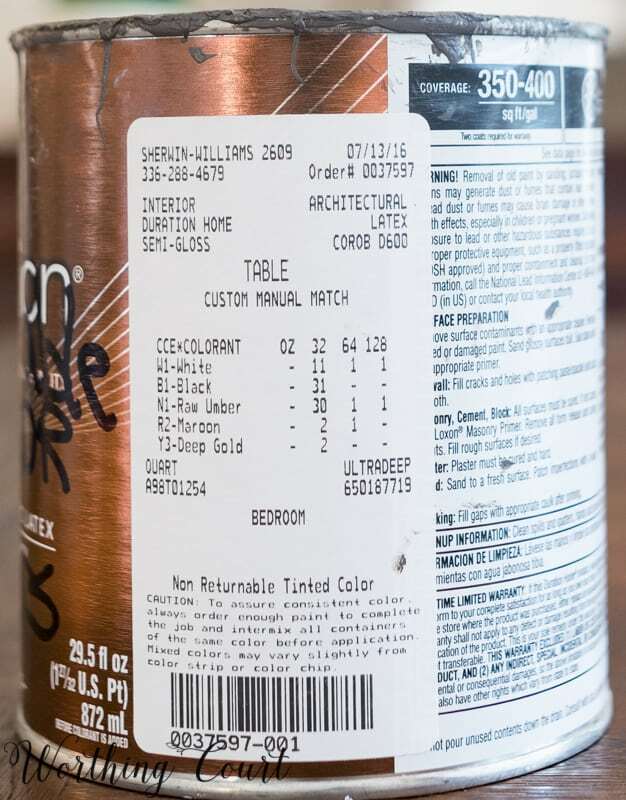 Scroll on down to get the formula for the matching paint that Sherwin Williams created. That left one more large piece of furniture that I truly never ever thought I would paint – the sideboard. But, guess what? It stood out like a sore thumb once the gray chest was brought in and the table legs and chairs were painted. However, I felt that having another solid gray piece of furniture in the room would be too matchy matchy, so I gave it a gray-wash, that allows some of the wood to show through, with the gray paint that the paint store had mixed for me. I used 1 cup of the gray paint mixed with 1/2 cup of water and applied it with a paint brush. I dabbed more paint on where needed and used a rag to wipe places off that had too much, until I got the look that I was after. I’ll have the room ready for its full reveal soon! In spite of my fear of painting my “nice” dining room furniture, I’m beyond happy that I did. Thank you to my daughter and to a sweet blogging friend who strongly encouraged me to go for it. I finally came to the realization that I would never be happy with my furniture as it was, no matter what else I did in the room. So, if you’re hesitant to paint any of your furniture, start out with something small and take it one step at a time. absolutely gorgeous, Suzy. that color gray is amazing! and wow, that check is perfect! Thank you so much, Debra! That gray check fabric is exactly what I wanted, but I didn’t think I’d be able to find it. where did you find the fabric. I have same cherry furniture and very scared to paint it. I will probably opt to make everything else light except it. I may do the painting on a much cheaper table though. Love it all. I agree! The color is subtle and rich looking…very inspiring! Suzy, your updates are amazing! I bet painting all of the furniture was hard work. I love the outcome! LOVE what you did to transform your dining room!! I would love to know where you got the rug and the name of it, if possible. Thanks so much and I really enjoy your blog..
Oh GF it looks AWESOME!!! I saw that fabric at 1502 yesterday and loved it…still trying to decide where I could use it other than for pillows LOL. Where did you find your rug? Let’s get together…it’s been too long!! So glad you like it, GF! You’re bound to have some that needs recovering. 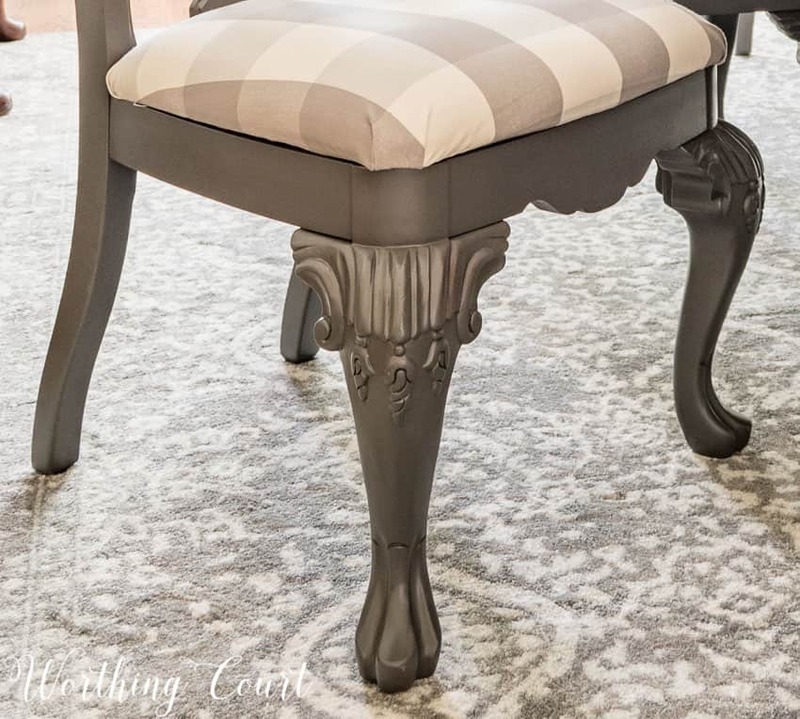 😛 The rug came from Rugs USA and there’s a link to it in this blog post: https://www.worthingcourtblog.com/dining-room-before-after/. And yes, we definitely need to get together – it’s been a crazy summer! I love it all. Where did you find that rug? I’ve been looking for something like it for some time. Would love to know the source!! Wow! What an incredible change. Looks like an entirely different room. Have enjoyed seeing all the changes you make. Thanks for sharing. So glad you’ve enjoyed watching the process! You absolutely did the right thing in painting the table and chairs! MUCH Better!! Love the checks on the chair cushions as well. You are definitely headed in a stellar direction!! YUM. Thank you, Linda. I was definitely nervous about painting any of the furniture, but now I’m so glad that I did! I have the same problems in my DR: lots of brown, formal furniture! Was considering purchasing a Home Right paint sprayer to apply a neutral paint, but was dreading the sanding part. Did you sand your chairs and table legs? I’m really tired of the cherry finish and want a different look. Help! I can’t get started on this project even though I love your look…guess I’m not sure how to proceed. So, did you sand? Hi Nancy. I know that the thought of tackling a project like this can seem daunting, but it really wasn’t hard at all – just a little time consuming. No, I didn’t sand anything. But I do recommend wiping your pieces down with a solution of TSP and water prior to painting. That will get rid of any fingerprint residue that could interfere with the paint adhering well. Can you tell me what TSP is? Also did you use primer before painting? I just purchased 5 cans of the same color you used and it said semi-gloss. Is that the correct finish? I can’t wait to see the transformation in my dinning room. I love it, Suzy! Painting the furniture was the best decision EVER! Can’t wait to see the entire room reveal! Thank you, my friend! It was a scary thing for me to do, but I’m glad that I did it! This is so beautiful and I always love your style! What a great idea to have paint mixed to match the spray, why didn’t I think of that? Thank you, Phyllis! I’m just glad the paint store was able to do such a good job matching it. I can’t wait to see the final reveal. Love the look of the painted dining room table and chairs. The washes for the other furniture pieces was a great way to change things up. So glad you like the table and chairs, Kathy. I was trying to keep everything from being to matchy-matchy, so hopefully using a paint wash on a couple of the pieces helped! Love it all. The completed room will be amazing. And just in time for fall decorating. The gray and white buffalo check is gorgeous. I also love the throw pillow. All of the furniture painting is beautiful. Thank you, Kathy. So glad you like everything! It all looks gorgeous, Suzy! Love what you did with the sideboard and that check fabric is awesome. Can’t wait to see it all together. Thank you, sweet sister friend! Wow…it’s stunning! Anxious to see the reveal!! Thank you, Cheryl. I was thrilled when I stumbled across that fabric! 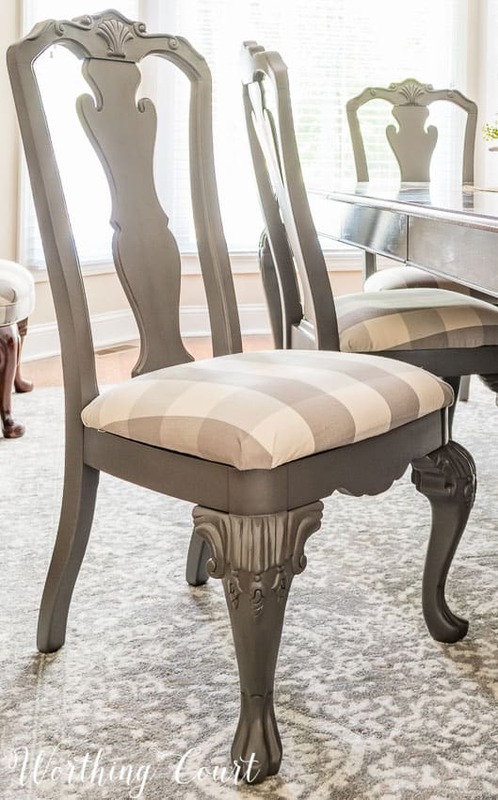 Where did you find the chair fabric? Have been following your progress on the dining room. It looks absolutely stunning!!! Thank you for following along, Gail. So glad that you like it! LOL…I so enjoyed reading how your room evolved one step at a time. I can see myself doing something similar, but definitely with something smaller. I love the sneak peak photos. That IS a lovely gray paint color! Can’t wait to see the whole reveal. The first piece of furniture that I ever sprayed painted was the light gray chest that’s in the dining room. Once I did it, there was no turning back! lol I agree – I love, love, love that shade of gray. Your dining chairs look lovely. That is a great color. You did a great job on your dining table and chairs. Thanks for sharing! Thank you, Cynthia. So glad you like them! Love the gray spray paint. Thanks for giving us the name brand and color. You took a bold step and boy did it pay off. It all looks so beautiful -Great job ! So glad you like it, Marilyn! I’m usually not to gutsy. For once I’m glad that I just went for it! I have been watching your beautiful dining room transformation on your blog. It is BEAUTIFUL. Your home is beautiful. You are so creative and I love that you share each step. Could you post a photo showing the entire dining room?? I would love to see how all of the painted furniture looks together. Thank you for sharing your home on your blog. Love, love, love your easy directions. I’ve been wanting to do this to my dining room but wasn’t sure of what color to use. You’ve inspired me to get busy! That’s great to hear, Pam. Have fun painting! Thank you for sharing your fabulous dining room! I have been lamenting over painting the furniture at our beach house, and you have given me the confidence to just do it!!!! The colors and patterns are exactly what I’ve imagined in my mind, and now I have pictures to prove how awesome my room will now be!!! Can’t wait to go through the rest of your redo’s (I just signed onto your site today), I know there’s allot more inspiration coming my way….thanks again for your talent! Hi Marilyn. I’m so glad that I was able to inspire you. Have fun painting! I’m a new follower and I Love your style! I cannot believe you spray painted the dining room furniture! It is stunning! I love me some buffalo check, such a classic neutral… So very happy to follow you and learn ways to change my home to reflect me instead of our sea of brown lol! Hugs and thanks! I love the way you used different techniques to bring your furniture new looks. I have some very old furniture which was expensive but needs to be restyled the way you did with yours. I just need to make the decision and take the plunge. Seeing your results makes me want to try! Thanks for your tip on the spray paint. I’ll be pinning that technique for my future projects. We’re not lazy, just extra efficient! i keep having to visit your dining room over and over. love that GRAY! and the rug is just perfect. Your dining room is amazing! I purchased the spray paint to have it color matched for my table and china hutch, what finish did you choose? Did I miss that in the comments? Hi Robbyn. I used semi gloss finish for the paint that I had mixed. Your dining room inspired me sooo much that I’ve been copying your talent for my beach house (I think I had left a remark earlier about how you’ve inspired me!). I’m having great difficulty in getting my paint store to “get it right” with the Anodized Bronze for the table…it keeps coming out brown. Would you possible share with me the store name, and color blend that they came up with to match your table to your chairs? Thanks ever so much! Hi Marilyn. I’m happy to share the formula, but it has a ton of numbers. Just sent you an email about it. You might want to check your spam folder if you don’t see it. 😀 The email will be from handgrs@gmail.com . Your dining room is beautiful. Can you please share the formula for the Anodized Bronze for the table? Thank you!! Hi Martressa. Please send me an email request to worthingcourtblog.com and I’ll send it to you. I can’t post a picture here in the comments. Hi Suzy. I tried to send you an email request but was unable to send due to a error in the email recipient. Gah! That’s my fault – I gave you the wrong email address. So sorry! Please send it to worthingcourtblog@gmail.com. Where did you find your dining room curtains? Are they lined? Thank you! Hi Sheila. The only thing that I did to the chairs prior to painting them is to dust them and wipe them down with TSP, to remove any fingerprint residue that had accumulated over the ten’ish years that we’ve owned them. I think that each chair took two complete coats of paint, but that I hit a few spots that didn’t have complete coverage with a third coat. If you paint your chairs cream, it may take more coats than mine did. Have fun with your room! Thanks so much!!! Do you think I could distress with the cannned paint? I spray paint everything outside. Now I have some end tables trying to decide. I get so nervous, because I want everything to be perfect. Ugh!!! Thanks again. I have been watching postings of dining sets in my town to buy one for my home. It’s a great item to buy second hand as most of the people point out it was rarely used. 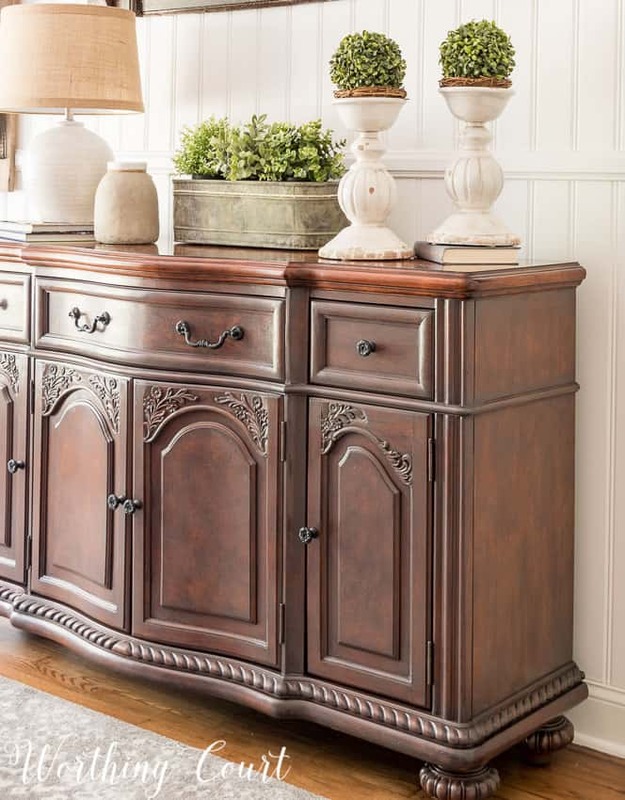 I’m looking for a farmhouse style and I’m not finding what I want. Oh does this post of your dining set Open my EYES! What a difference the paint and fabric does to transform the style of the furniture. Thank you! I have a better idea now on what to look for. I can’t believe the paint is Rustoleum Anodized Bronze and it turns out that gorgeous grey color! Even the cap in the store is more of a brownish color. How on earth did you stumble across that and know how great it would turn out?!! 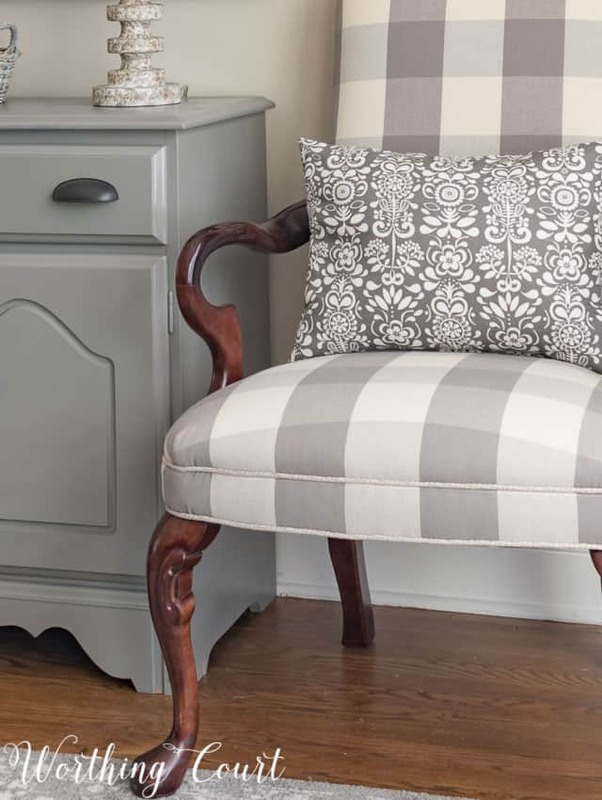 I used a flat grey on a wicker chair and I am not thrilled with – I now want to change it! Your house is gorgeous and it is so warm and inviting! Thanks for sharing! 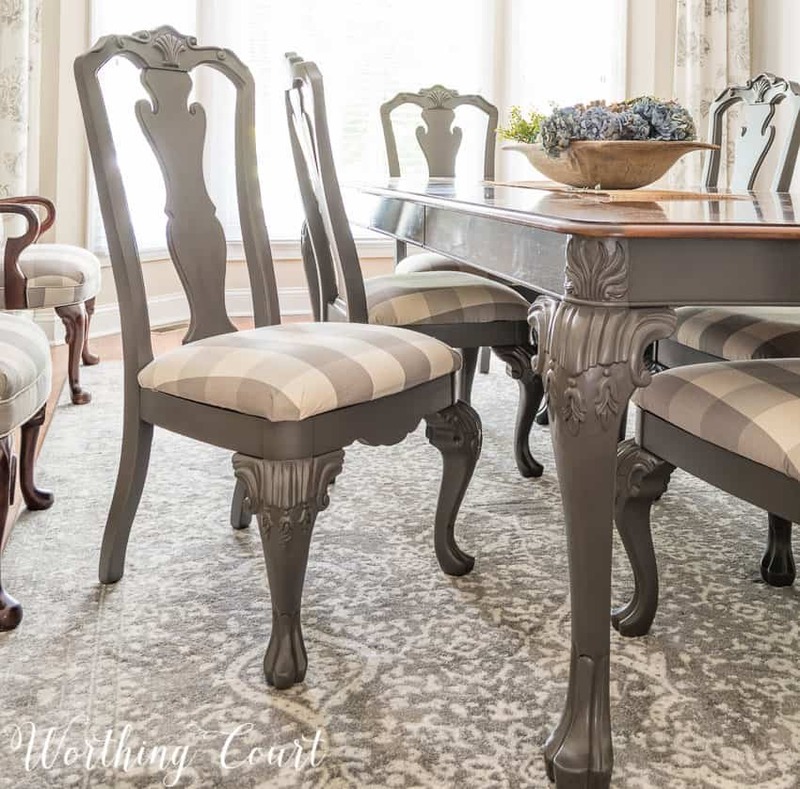 Can you share the lighter color of gray you used on the small chest in your dining room? Is that canned spray paint also? Oh my! You dining set is just beautiful. I have found gray to be one of the hardest colors to get right but you have done it. Thanks for the tip on the gray you used and the one about spray painting a board to get it color matched. I have been struggling with what color to use on the walls with dark gray chairs. I really love the soft color you used on the walls. I’m sure I can find what color it is by searching your blog, and I will, but just in case I don’t find it what color did you use? I’m brand new to your blog and I am really enjoying it. Hi Gail. I apologize for taking so long to respond to you! The walls are painted with Sherwin Williams Accessible Beige. Trying to find the rust oleum anodized bronze spray paint. Several different cans come up on my search. Some semi gloss. Some gloss. Some enamel spray paint to cover rust. Could you clarify exactly which one you used? Or maybe take a pic of the can of paint. Absolutely love what you did with that table and chairs. I am dying to know…is that the Carolina Gingham Gray or the French Gray. It’s so hard to tell online. Regarless it looks fantastic! Hi Wendi. I assume you’re asking about the fabric??? I honestly don’t know which color/pattern it is. lol I purchased the fabric at a local fabric store and I don’t believe that the description specified which it was. Hi , I am new to your page and the dinning room is truly beautiful. If I have this correct you made a wash for the mirror of water and paint. Could you tell me if you used oil base paint or acrylic on it and the table and sideboard. This dining room looks great! I am hoping to get a dining room set from Craigslist and do a similar re-do. The only Rustoleum Anodized Bronze I saw at Home Depot was a metallic finish, which I assume is high gloss. Is that what you used? I’m not seeing it available in other formulations on the Rustoleum website. Thanks! Hi Donna. The Anodized Bronze that I used wasn’t a metallic finish, but it was a gloss finish. Here’s an Amazon link to the exact one that I used: https://rstyle.me/n/de7q6ab7z57. The exact paint comes up at Lowe’s. I’m searching for the right color to do my cherry bedroom set and think this gray might do the trick. I’m afraid of going too light thinking the cherry might bleed through. But this gray is gorgeous. Even though everyone recommends that I go with a cream or linen color, the deeper tones always attract my eye. It’s unanimous, your dining room is beautiful!